Really solid stay. Comfortable, clean, peaceful and accommodating. Third stay here and will be back. We have stayed at other similar accommodations in town, but find ourselves coming back here. They seem to do things just a bit better. 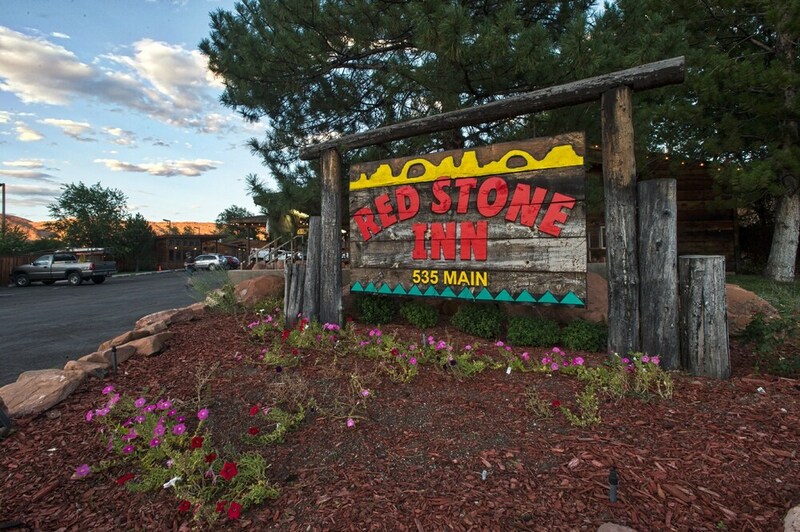 Moab is the gateway to the great outdoors, and Red Stone Inn is one of many options for lodging. I appreciate that it's dog friendly, has comfortable beds and a nice staff. Rooms are on the small side, but very clean. My main issue is the traffic noise. I had a room very close to the street and I like open windows instead of heater/AC (when the weather is nice). The road just outside my window is a busy main street, with loud trucks all night long. If you have the option, ask for a room further from the road. Also, the "free" coffee service didn't start until after 8am. Not much of a perk for early risers like me. The location was great. Very close to Arches NP and not far to Canyonlands. Walking distance to downtown. Rooms were small And a little dated but very clean. The laundry facilities were convenient. There were some noisy guests in the middle of the night that woke us up... but not hotel’s fault... just inconsiderate people. Staff was very friendly. The rooms were insanely small, it was really tight for two adults and a dog. That saying however they ARE pet friendly which was nice. TV works and bathrooms are clean. Few amenities in the room however, and there is no breakfast served. You are close to many delicious restaurants however! The small hottub is often occupied so don’t count on it in your stay, but it is rustic, and a place to spend the night. Noisy place, and the room was old and smelly. They have not updated this place in 30 years. My son and I stayed there and there was so much partying going on we could not sleep. When we checked out the front desk person was no where to be found and we had to walk around to find them. We took a winter, off season trip to Moab, and were lucky enough to find this place had JUST opened that week after winter break. Basic lodgings with a small kitchenette (microwave only). BUT, pet friendly ($10 fee), Hot Tub that's really hot and CLEAN. And the best part, a really REALLY good off season rate. Walking distance to good restaurants and a grocery store. Pet relief area with disposal bags. Free wifi and Plenty of hot water with good pressure. We will be back! I spent four nights at the Red Stone Inn whilst on a fieldtrip. The rooms we stayed in were quite large, though the beds took up most of the space. The small kitchenette was clean and had adequate facilities and items in terms of cutlery and crockery, a sink, microwave, fridge etc. The table was small and only had one chair despite it being a twin room, but that wasn't really an issue. No food was served at the hotel, but its central location in Moab meant that walking to nearby restaurants and supermarkets was easy and a variety of options were available; our personal favourite was the Moab Grill. The room service staff were friendly and willing to provide anything we needed, our towels were changed every day and the room was left tidy when we returned. The on site launderette, hot tub and barbecue area were nice additions, though we didn't have time to try them out. Overall our stay was pleasant, the hotel itself is quite basic but it served its purpose just fine - would recommend. Exceedingly clean and comfortable, small rooms. Friendly, helpful staff. Laundry and hot tub were great extra amenities. Centrally located to several good restaurants; Blu Pig, Moab Brewery, Moab Grill. This was a last minute option for us that I was grateful to snag since everything else was booked in town that could accommodate a dog. But, I would like to warn others, this inn is very basic. For the high price we were charged, I felt ripped off. The beds and pillows are super uncomfortable, no breakfast, crammed parking lot, the customer service was bad, and the buildings are somewhat outdated. But it gave us a place to stay with my dog. If you don’t have an animal, and have all options available to you, I recommend you check everywhere else before you book here. This seems to be a favorite hotel of the adventure seeker. It is one of the most reasonably priced hotels in Moab, and so a hangout for hikers etc. It is relatively well located, easy to get to and has several eateries nearby, including a grocery store that sells premade sandwiches etc. for picnics and trail snacks. This is a "down to basics" sort of place, but the room was clean and the bed was great for sleeping - so who can ask for anything more? I noticed there was a laundry room with ice machine. Everyone was very friendly and I enjoyed my 3 night stay. Red Stone Inn places you within a short walk of Moab Information Center and within a mile (2 km) of Museum of Moab. This 45-room motel has free in-room WiFi, free self parking, and a spa tub. Guests can expect to find free WiFi and 32-inch a TV with cable channels. The bathroom offers hair dryers and free toiletries. Other standard amenities include a kitchenette, a refrigerator, and a microwave. Guests of Red Stone Inn enjoy a spa tub, free WiFi in public areas, and a seasonal outdoor pool. If you plan to drive, free parking is available. The front desk is staffed 24 hours a day to help with securing valuables and luggage storage. Additional amenities include laundry facilities, barbecue grills, and a picnic area. The motel has a seasonal outdoor pool and a spa tub. The preferred airport is Moab, UT (CNY-Canyonlands Field): 23-min drive, 18.9 mi/30.3 km.